There's something so personal and unique about luggage. More than holding items for travel, luggage also reflects the owner's personality and sense of style. Nowadays, luggage needs to be as light and compact as possible, packed with features that help owners carry as much stuff with the least amount of effort. Several decades ago, however, luggage look and feel very different. Luggage designs reflect the evolution of how people travel. When travel was only accessible to the rich, trunks and heavy suitcases are all the rage. Butlers and nannies are always at hand to do all the heavy lifting, anyway. 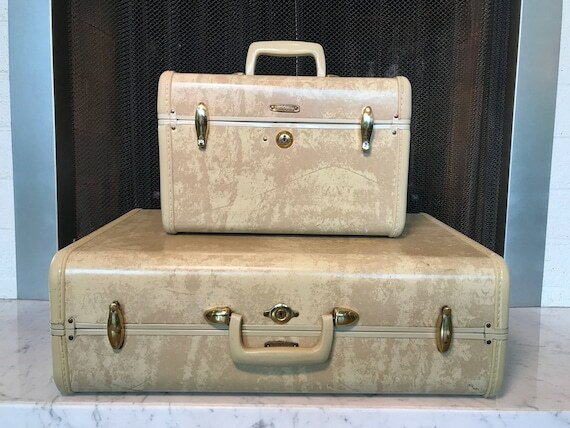 Why Choose Vintage Samsonite Luggage? After a while, luggage became smaller as travel became more personalized. The host of maids and butlers also wilted away as travel became more accessible to more people. Modernization was affected by airline restrictions in weight, size, and pieces allowed onboard. While luggage pieces now are nice to look at, they lack the charm and character that genuine leather and handcrafted materials exude. Every dent, stain, and hardware tell stories of the luggage's past as well as its owners. However, you still want something you can use on your own travels in the modern era. While age is charming, you don't want to carry around something old and dilapidated. That's where vintage Samsonite luggage wins. Durable, practical, and always beautiful, vintage Samsonite luggage stands out as both a travel essential and a show piece. 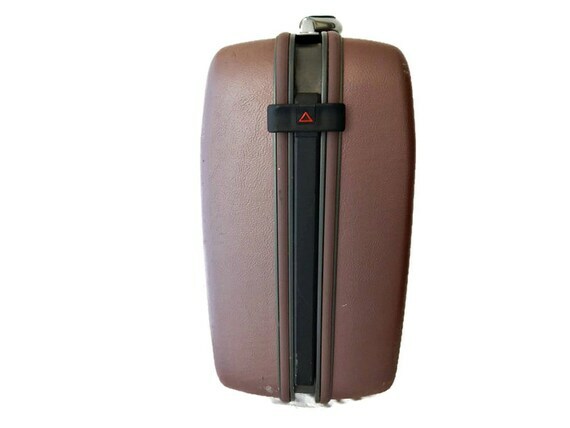 It's not too difficult to find one in good working condition because Samsonite luggage are well-made in classic designs. That's what makes the brand so popular in the first place, even with their modern luggage. However, it's still important to check the details and make sure you're getting your money's worth. Travel was different in the 50's and 60's so features are also different. Rolling luggage was not a thing and there wasn't much need for too many nooks and crannies inside and outside the luggage. The look was more important than the function because, in those days, luggage was a fashion statement and a symbol of one's status. Nevertheless, they're still meant to be useful for travel. 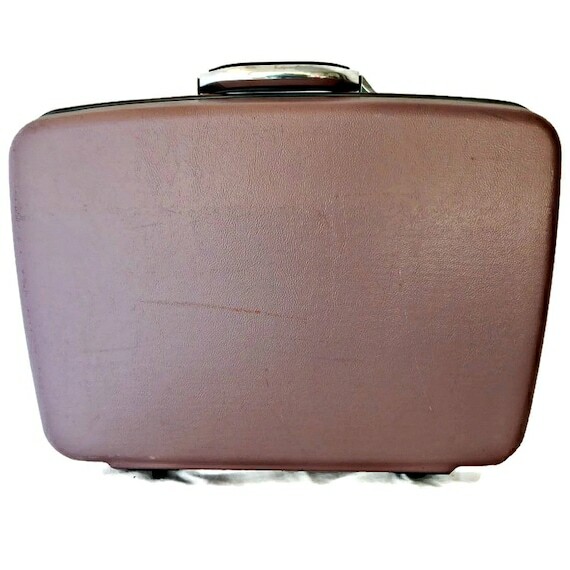 A bit of research and some patience will result in the perfect vintage Samsonite luggage for all your travels. Some vintage pieces come as they are. Some also have parts replaced or exteriors refurbished. You'll want to have a piece that's as original as possible, but that means accepting flaws, dents, and stains that are more or less inevitable in a fully original piece. If you're going for aesthetic and functionality rather than owning a collectible, replacement parts can be good to ensure that your luggage doesn't fall apart. Research on what the original pieces look like and make a comparison on what flaws and replacements you're willing to accept. Lining is an important feature of any luggage but is also the most prone to flaws and replacement. It's possible to find original lining in pristine condition, though. Again, the only value of having the original lining intact is to preserve the value of the vintage. Otherwise, whether or not it's replaced, look out for holes and other signs of wear and tear. High-end vintage will usually line the luggage with leather, velvet, or silk, while lower-end pieces will have canvas or cotton. 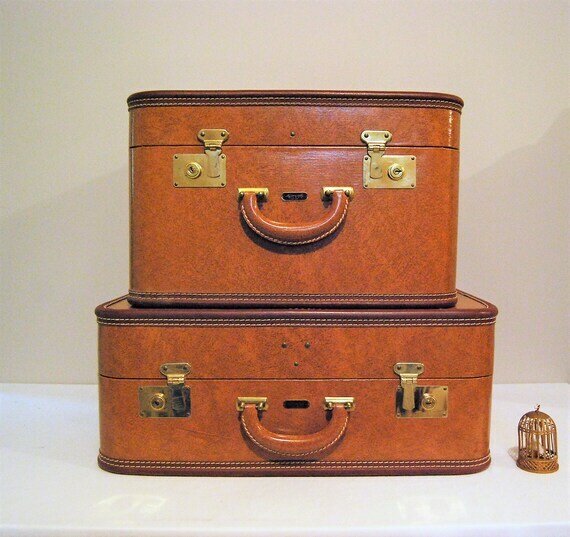 Vintage luggage are commonly embellished with metal fittings. Clasps are also common closures, but some will have locks and keys. Most vintage luggage won't come with keys anymore, but the latches and clasps should still work properly. These are very delicate in nature and will most likely show signs of wear and tear. Check clasps, locks, and hinges for abrasions, rust, and functionality. If it's unclear with the photos, send the seller a message to make sure they're still usable. Unless you already know what particular brand and model you are looking for, vintage hunting online is like looking for a needle in a haystack. The internet is also rife with scammers. A great place to look in is Etsy. Not only can you find great luggage, you can also see reviews about the seller from other buyers. Pay attention to these reviews so you'll know how responsive the seller is and how honest he is about his products based on customer satisfaction. 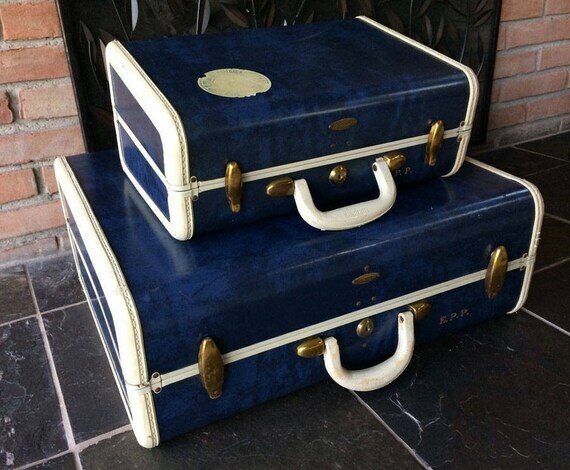 In true classic fashion, this luggage set popular in the 1950s is an eye catcher. Since it comes as a set, it's a great deal under $200. 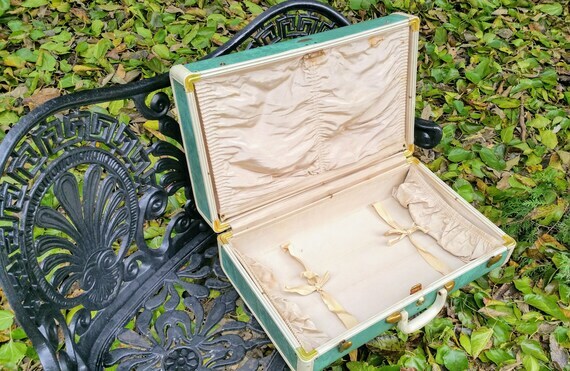 The vanity case measures 15 x 10 x 7 inches in good condition and a few signs of wear and tear. The interior is lined with mauve taffeta. There are signs of staining and fading. It has two dividers and a small pocket on the lid. Inside is a perfectly intact mirror. The exterior is very clean with usual signs of wear and tear, but no big issues in terms of aesthetic. The suitcase below is in excellent condition, but has a few more signs of travel wear. At 21 x 13 x 8 inches, it's a good luggage for an overnight or weekend trip. The outside, however, has a considerable amount of scratching. Understandably, this is on the side that touches the floor when you open the luggage or when you set your luggage down. The inside is much better. There are a few stains on the pocket divider on the lid. Otherwise, the lining is great. The luggage closes via metal clasps, but they keys are already lost. An almost similar look and feel as above, this Samsonite Streamline luggage is another great find. 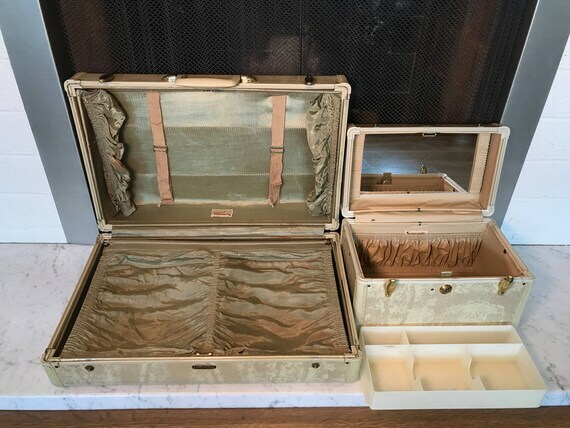 The rawhide exterior of this train case and suitcase set is kept in exceptionally good condition. Minor scuffing and small scratches due to use, but you'd have to take a very close look to notice. The best part? It has keys! The nylon lining is intact and beautiful. 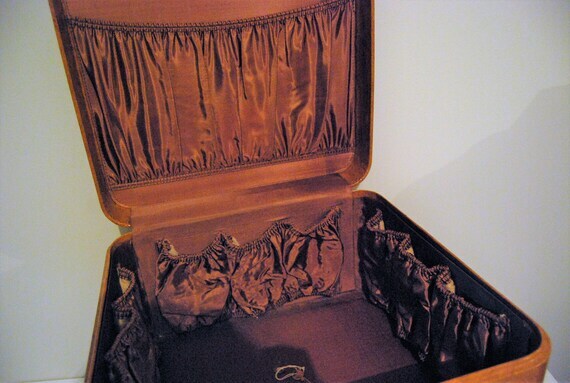 The suitcase has side pockets, a divider, and two tie straps free of stain, tears, or loose stitches. 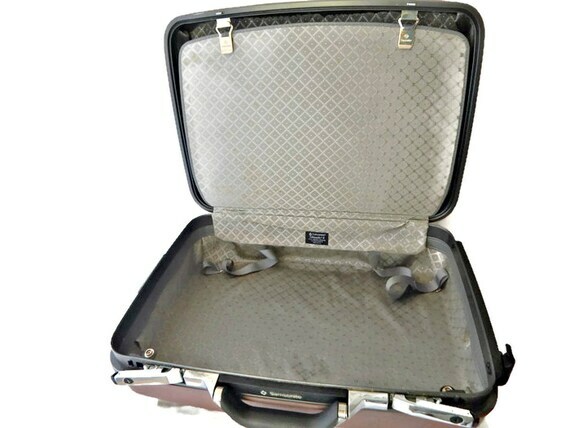 The train case has one main pocket and comes with an interior drawer. The lid is fitted with an interior mirror that's still very clear and free of chips and scratches. At 13.5 x 8.5 x 7.5 inches for the train case and 21.25 x 13.5 x 7 inches for the suitcase, this lovely pair is a great tandem for a classy weekend trip. Both are fitted with brass snaps and hinges that are working perfectly. This beautiful Loyal, New York set has no smell, no wear, no scratches or scuffs. It's almost as good as new with all the charm of antique luggage in the 50s. It's more than double what you'll pay for the first two sets in this list, but it's an incredibly rare find and worth the money. The brass hardware are all working and free of rust and damaging abrasion. The satin interiors are pristine and decorated with an ivory trim. The train case below and left measures 17 x 12 x 17 inches. It has a large pocket on the lid and several side pockets along the perimeter of the interior. The suitcase on the right measures 21 x 8.5 x 18 inches. It also has an open base with side pockets. 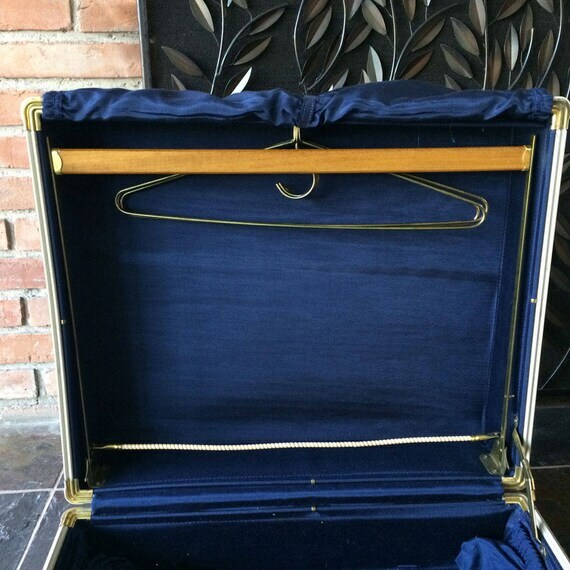 A beautiful feature is the satin cover on the lid that rolls up to reveal original hangers still intact. The train and suitcases are fairly larger than other vintage suitcases. They have deeper compartments and more pockets for more functionality as a travel luggage. 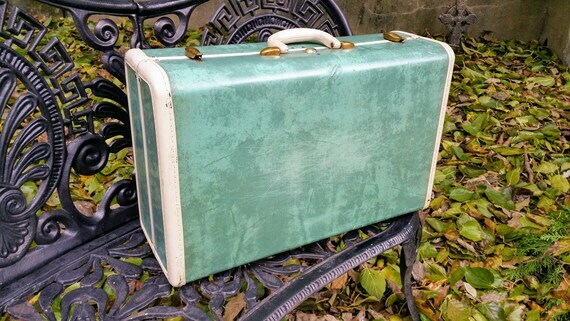 The 50s is a popular era for beautifully crafted luggage, and this is another stunner. The blue vinyl has a marble finish accented by the ivory trimming and brass fittings. The mysterious owner's initials, "E.P.P" are monogrammed on both cases, while a sticker that faintly reads "Chanbris America Lines" is on the train case. 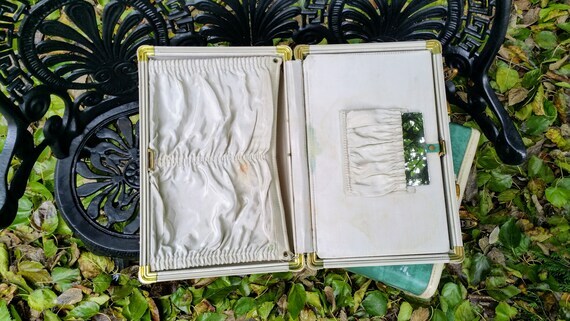 Under the keyholes, both cases are marked with a brass badge that says "Shwayder Bros, Inc., Samsonite, Detroit Denver". The details may be small and trivial, but these are small hints that this set was made on the higher end spectrum of this luggage line at the time. The blue taffeta lining is in near perfect condition. The train case measures 15 x 7 x 11 inches. It has four interior pockets and two compartments with dividers. The suitcase measures 21.5 x 9 x 18 inches with almost modern organization options. One compartment has side pockets and two ties to hold clothes and other items in place. On the other side is a hardwood compartment with a maple bar for hanging trousers and three brass hangers. At the bottom is an elastic cable to hold the garments down during travel. The whole contraption is supported by a brass frame. This is overall a great piece of vintage luggage that looks great and serves its purpose even in the modern age of travel. 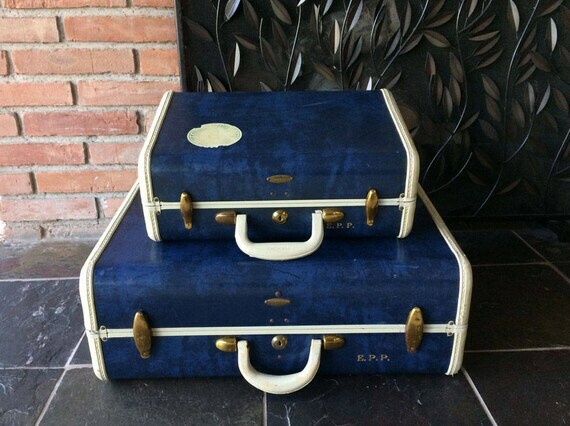 The vintage line of the Royal Traveller Montbello Luggage is a very sought-after vintage collectible. The line comes in several bright colors reflective of the flower power era of the 70s. You'll find a piece from this line being sold online, but a complete set of 4 is very hard to find. This luggage set comes with a large and a small suitcase, a shoulder bag, and a tote bag. 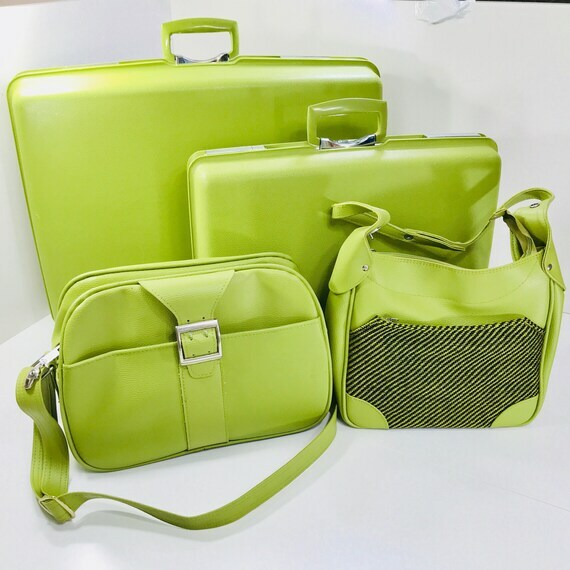 A cosmetic or train case is also part of the line, but not included in this set. The lime green color is shocking at best, but it's definitely a show stopper and very distinct. 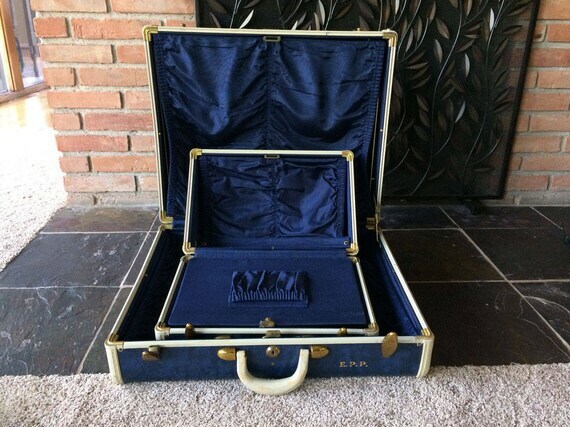 This spotless vintage comes with the original keys for the suitcases, which is another rare thing to have. The shoulder bag also comes with a built-in lock, and the key for that is available as well. The exterior is made of plastic. There are a few scuffs and scratches, but given the material and the color, nothing really stands out. 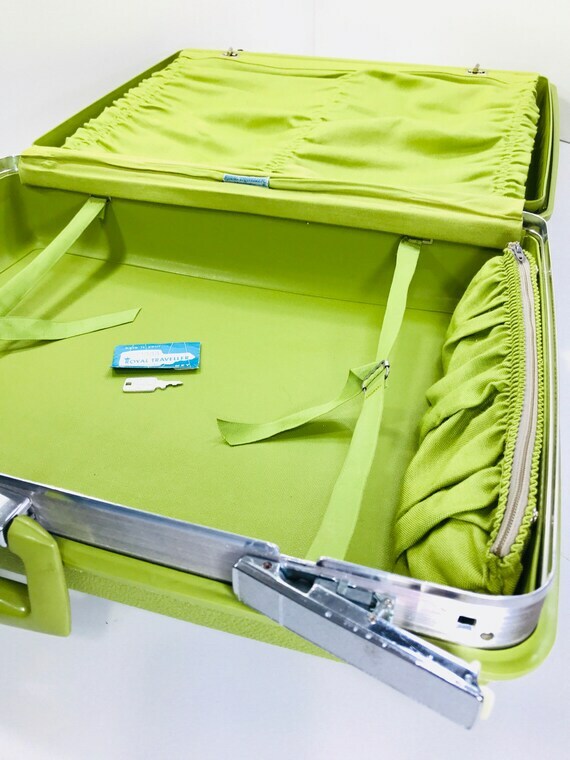 The suitcases are lined with the same green color and comes with side pockets and garment ties. The silver metal accents are uniform across all bags. There are no visible signs of abrasion and all the latches work perfectly. 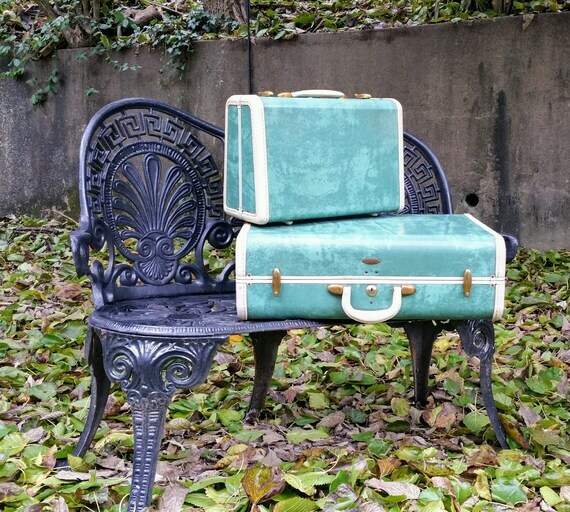 Most vintage finds are suitcases meant to be carried by either the traveler or the help. Later on, however, wheels started showing up. With more people traveling, farther destinations available, and less help from butlers or from staff, people started opting to pull their luggage around. 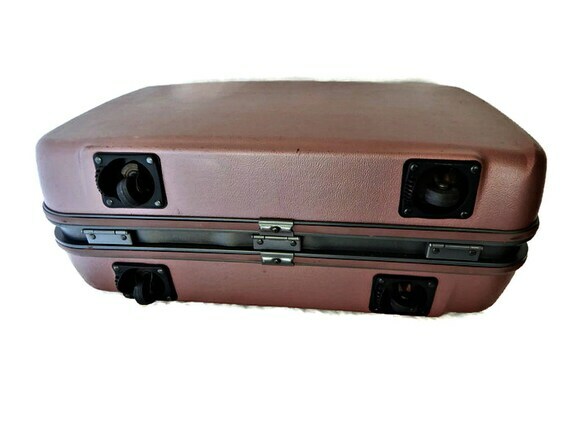 In the 80s, there wasn't much innovation in terms of technology or build of the suitcase other than the wheels. 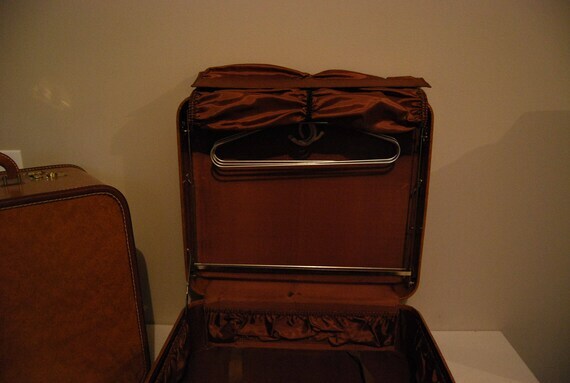 This vintage Rolling Suitcase with pullstrap is the start of what we know as rolling luggage today. It measures 22 x 16.5 x 7 inches made of a hard shell case, vinyl, and metal fittings. There is no key, unfortunately, but other than a few barely visible scratches, it's in great condition. The handle latches are in great working condition. The pull strap is tucked on the side and extends for you to literally pull the suitcase. The suitcase is not particularly stable due to its shape, but the wheels still roll without any snags. The inside is relatively clean. There are some small stains in different parts of the interior, but still in great condition. There is a divider held by metal clips and two straps on the other side.